The electric-auto maker shocked Wall Street by posting a big profit in the third quarter. Tesla (NASDAQ:TSLA) caught investors off guard last Wednesday by reporting a massive third-quarter profit of $312 million. This was just the third time in the company's history that it has reported a quarterly profit under GAAP accounting rules, and it easily set a new earnings record for Tesla. That said, the mere fact that the electric vehicle pioneer turned profitable was not especially shocking. While analysts had on average expected a small loss, Tesla had previously projected that it would be profitable for the quarter. Yet there were plenty of surprises in the earnings report. Here are three big ones. Three months ago, Tesla reported that Model 3 gross margin was "slightly positive" in the second quarter. At the time, it forecast that Model 3 gross margin would improve to around 15% in the third quarter and around 20% in the fourth quarter, on the way to a long-term goal of 25%. Tesla began delivering more expensive all-wheel-drive versions of the Model 3 last quarter. It also increased the production rate. These two factors clearly supported a big improvement in gross margin. Yet with the mix of Model 3 cars certain to gravitate toward cheaper versions over time, it was hard to see a path from Tesla's projected Q3 Model 3 gross margin of 15% to the long-term goal of a 25% gross margin -- even allowing for further manufacturing cost reductions. However, Tesla at least partially addressed this concern by reporting Model 3 gross margin in excess of 20% for the third quarter. This quickly put the company close to reaching its long-term margin target for its newest vehicle. The margin outperformance was particularly notable because it represented a clean break from Tesla's track record of repeatedly missing its forecasts. Tesla's gross margin for the Model 3 surpassed management's guidance. Image source: Tesla. Tesla will still need to achieve substantial cost reductions to offset the introduction of cheaper Model 3 options, but the 25% long-term gross margin target looks a lot more plausible now than it did a week ago. The unexpectedly high gross margin result for the Model 3 was the most important factor in Tesla's earnings beat. However, strong operating expense control also played a big role. In the second quarter, while research and development (R&D) spending rose less than 5% year over year, Tesla's selling, general, and administrative (SG&A) expenses surged 40% year over year and 9% sequentially. Considering that Tesla's vehicle deliveries doubled in the third quarter compared to the second quarter, it would have been natural to expect another big step-up in SG&A expense last quarter. Instead, SG&A expense declined 3% sequentially to $730 million. On a year-over-year basis, SG&A was up just 12%. Tesla also reported a sequential decline of 9% and a year-over-year increase of just 6% on the R&D line. Tesla attributed the strong cost performance to recent cost-cutting actions and having already completed most of the development work for the Model 3. Tesla's Model 3 gross margin beat may have been the main factor in bringing the company to profitability last quarter, but spending discipline was the difference between eking out a profit and reporting blowout earnings. Lastly, Tesla's cash flow performance was even more impressive than its earnings. 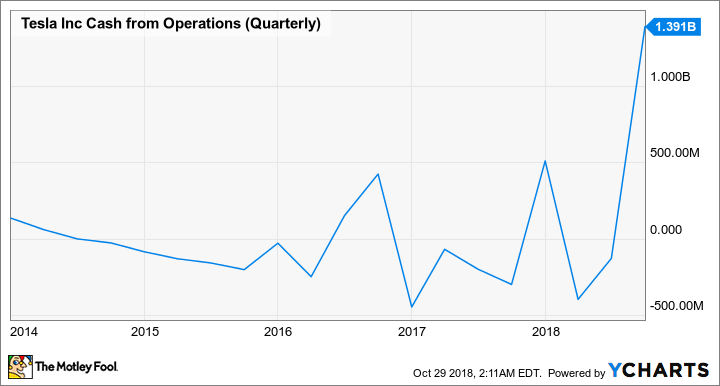 Operating cash flow surged to $1.4 billion in the third quarter after being negative in the first two quarters of the year. Previously, Tesla had never generated more than roughly $500 million of operating cash flow in a quarter. Tesla Cash from Operations (Quarterly), data by YCharts. Free cash flow reached $881 million last quarter, which was substantially higher than Tesla's net income. Part of the discrepancy came from the $205 million in share-based compensation that Tesla handed out, while working capital improvements also made a modest contribution. However, Tesla's strong free cash flow primarily reflected rock-solid operating performance. That suggests there was more to its big earnings beat than accounting tricks. It also means that Tesla's goal of remaining profitable in Q4 -- and hopefully in 2019 as well -- could be within reach.